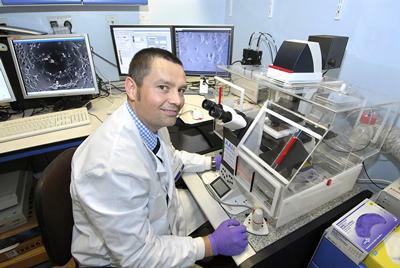 Scientists at the University of Southampton have discovered a potential and novel way of preventing asthma at the origin of the disease, a finding that could challenge the current understanding of the condition. The research, published in The Journal of Clinical Investigation (JCI) Insight, analysed the impact of the gene ADAM33, which is associated with the development of asthma. ADAM33 makes an enzyme, which is attached to cells in the airway muscles. When the enzyme loses its anchor to the cell surface, it is prone to going rogue around the lung causing poorer lung function in people who have asthma. The studies in human tissue samples and mice, led by Hans Michel Haitchi, Associate Professor in Respiratory Medicine at the University of Southampton, suggests that if you switch off ADAM33 or prevent it from going rouge, the features of asthma - airway remodelling (more muscle and blood vessels around the airways), twitchiness and inflammation - will be reduced. The first study showed that rogue human ADAM33 causes airway remodelling resulting in more muscle and blood vessels around the airways of developing lungs but it did not cause inflammation. When a house dust mite allergen was introduced, which is a common human allergen, both, airway remodelling and allergic airway inflammation were more significantly enhanced. In another study, remodelling of the airway was shown in mice that had ADAM33 switched on from in utero. The gene was then switched off and the airway remodelling was completely reversed. Furthermore they studied the impact of house dust mite allergen on asthma features in mice that had the ADAM33 gene removed. Airway remodelling and twitchiness as well as airway inflammation rates were significantly reduced by 50 per cent and respectively 35 per cent in mice that did not have the rogue gene. These findings identify ADAM33 as a novel target for disease modifying therapy in asthma. Professor Haitchi, whose research was primarily funded by a Medical Research Council Clinician Scientist Fellowship said: “Our studies have challenged the common paradigm that airway remodelling in asthma is a consequence of inflammation. Instead, we have shown that rogue human ADAM33 initiates airway remodelling that promotes allergic inflammation and twitchiness of the airways in the presence of allergen.